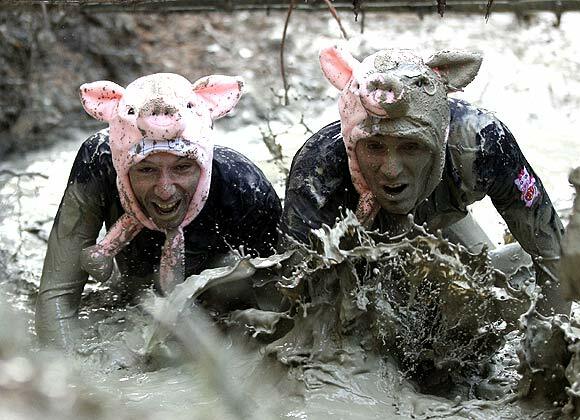 Participants cross a mud obstacle during the Wild Boar Dirt Run (Wild Sau Dirt Run) in Laaben, 50 kilometers (31 miles) west of Vienna, October 22. Some one thousand competitors take part in the annual event, which consists of a cross country run followed by an assault course over a distance of either 10 or 20 kilometres ( 6.2 - 12.3 miles). Model Kate is painted by artist Emma Hack in central London October 6, 2011. Hack, a leading skin illustrator, is painting naked models in front of visitors to the Art London fair, camouflaging them against a wallpaper background designed by Australian interior designer, Florence Broadhurst. 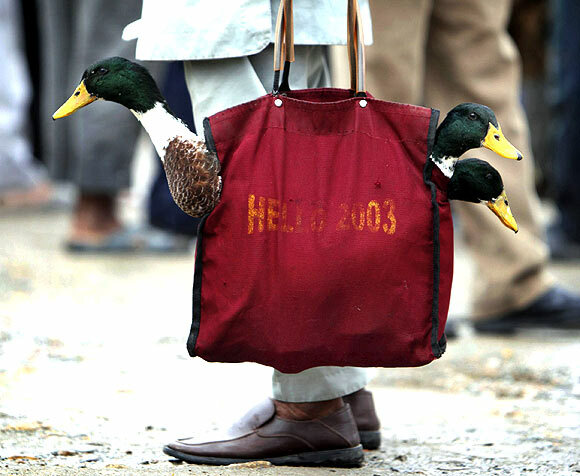 A man carries in a shopping bag ducks to be sacrificed at a livestock market in Kathmandu October 3, 2011. The Hindu festival of Navaratri, also known as the Dasain festival, celebrates the triumph of good over evil. Hindus will also offer sacrificial animals during the festival. 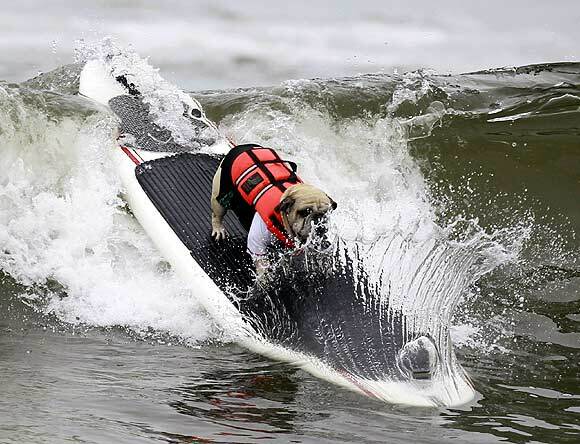 A dog rides a wave at a surf dog contest in Huntington Beach, California September 25, 2011. 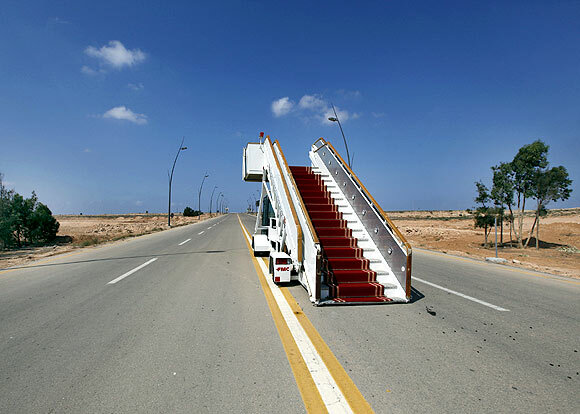 An abandoned VIP stairway is seen on a road at the airport in Sirte, which is now under the control of anti- Gaddafi fighters, September 29, 2011. Forces of Libya's interim government have captured the airport in Muammar Gaddafi's hometown of Sirte, one of two main remaining bastions of support for the deposed leader, Reuters journalists at the scene said. 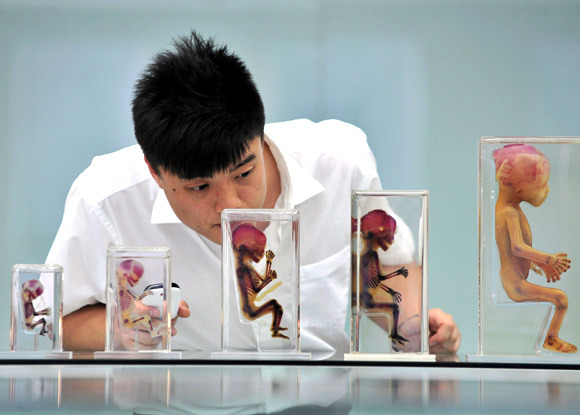 A visitor looks at foetus specimens at the "Mysterious Life" museum of Dalian Hoffen Bio-Technique Co. Ltd. in Dalian, Liaoning province September 13, 2011. Founded by Dr. Sui Hongjin in 2004, Dalian Hoffen Bio-Technique Co. Ltd. produces, preserves and exhibits plastinated biotic specimens of human and animals. The specimens, including whole bodies as well as individual organs and transparent body slices, each requires four employees to work on it for 8 to 12 months. The exhibits have been meticulously dissected and preserved to allow visitors to view muscular, nervous, circulatory, respiratory and digestive systems. According to Sui, the bodies are legally collected from medical universities. Picture taken September 13, 2011. 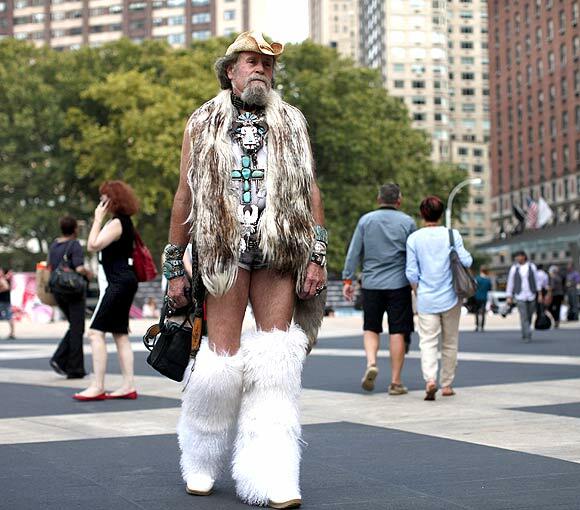 George Schrhamm walks outside the Lincoln Center, the venue for New York Fashion Week September 13, 2011. 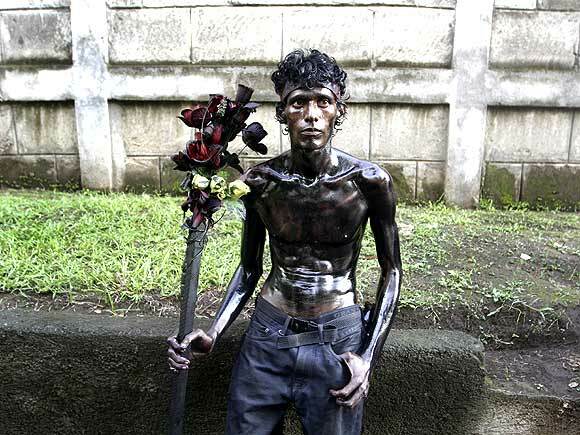 A devotee covered in motor oil takes a rest in the celebrations honouring the patron saint of Managua, Santo Domingo de Guzman, in Managua August 1, 2011. Zoo owner and artist Aleksandr Pylyshenko sits inside a cage with female African lion Katya at a private zoo situated in his yard in the city of Vasilyevka, southeastern Ukraine August 3, 2011. 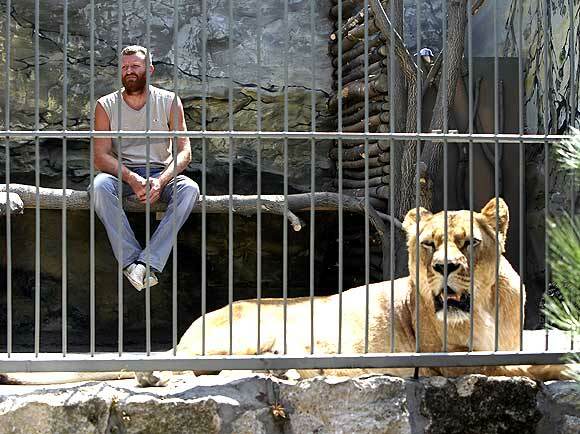 Pylyshenko decided to spend five weeks in a cage with a pair of African lions, Katya and Samson, to get money for improving the lions' living conditions, according to local media. He is broadcasting it on internet to attract the public's attention to plight of wild animals in private Ukrainian zoos, which do not get enough fundings. 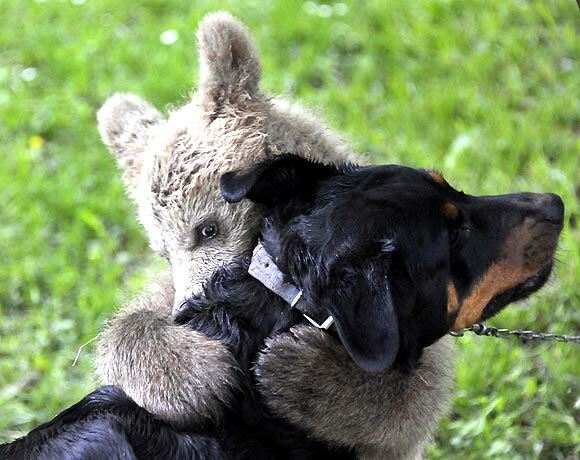 Brown bear (Ursus arctos) cub Medo plays with the Logar family dog in Podvrh village, central Slovenia June 1, 2011. The Slovenian Logar family has adopted the three-and-half-month-old bear cub that strolled into their yard about 30 days ago. Although the family would like to prepare a fenced enclosure for it, veterinary authorities would prefer to move it into a shelter for wild animals. 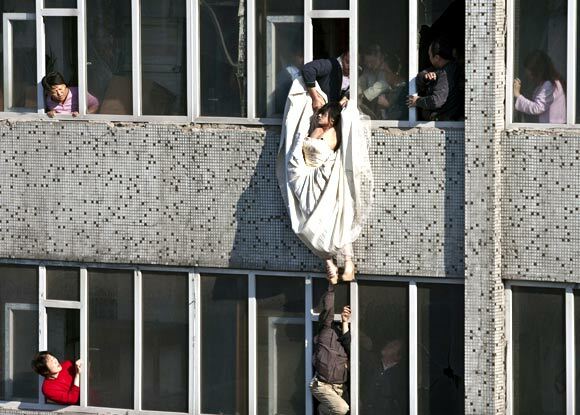 A 22-year-old woman in a wedding gown is grabbed by Guo Zhongfan, a local community officer, as she attempts to kill herself by jumping out of a seven-storey residential building in Changchun, Jilin province May 17, 2011. According to local media, the woman tried to commit suicide after her boyfriend of four years broke up with her, just as they were making plans to get married. The woman did not sustain any injuries during the incident. Picture taken May 17, 2011.